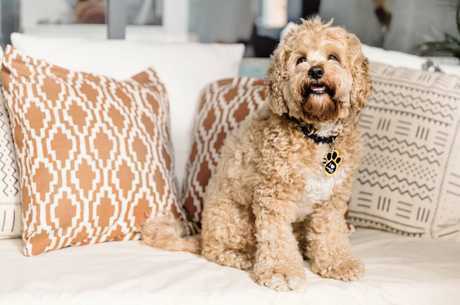 Osher Günsberg, host of reality TV franchise, The Bachelor Australia, said: “I’m passionate about mental health, and that extends to my dog, Frankie’s, wellbeing too. IF you're feeling guilty about leaving your pooch at home all day, this might just ease your guilt. Audible.com.au has announced the release of Audible for Dogs, a curated collection of audiobooks for dog owners to play when leaving their furry friends at home. Curated in collaboration with dog-lover, Osher Günsberg, and animal behaviourist, Dr Susan Hazel, Audible for Dogs was inspired by an independent study by Hartpury College in the UK. The study suggests listening to audiobooks can positively influence kennelled dogs' behaviour, spending less time alert and more time resting compared to other audio influences like music. If you think the idea is crazy consider this. Aussies are now collectively spending a whopping $12.2 billion on our pets each year. Audible.com.au worked with Dr Susan Hazel and Osher Günsberg to curate the Audible for Dogs collection, chosen for their "calming narration, evenly paced narrative, and length to cover a full workday away from home". Selections include Jane Austen's Pride and Prejudice narrated by Rosamund Pike, Charles Dickens' David Copperfield narrated by Richard Armitage, and Lucy Maud Montgomery's Anne of Green Gables, narrated by Rachel McAdams. Selected audiobooks from the curated collection have been bundled together, so dog-lovers can choose a Classics collection for high-brow canines, or an Aussie collection for their true-blue heelers. The Hartpury College research also suggests a narrator whose gender, accent and tone are similar to the primary owners may contribute to calmer canine behaviour. Yes, they are serious. Some of the selections on offer. Australian audiobooks Cloudstreet by Tim Winton, narrated by Peter Hosking, and Kerry Greenwood's The Spotted Dog, narrated by Jennifer Vuletic, were also included, along with Osher Günsberg and his precious wedding-ring-bearer pup, Frankie's favourite, The Lord of the Rings: The Fellowship of the Ring, by J.R.R. Tolkien and narrated by Rob Inglis. 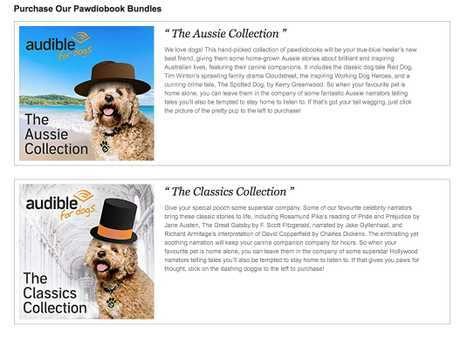 Audible.com.au has also partnered with the Sydney Dogs and Cats Home. Audiobooks from the Audible for Dogs collection are being played for their rescue dogs, who may find the shelter environment stressful. From today until 2 November 2019, Audible.com.au will donate $1.00 per purchase of any audiobook in the Audible for Dogs collection to the Sydney Dogs and Cats Home, up to a maximum donation of $10,000. Dr Susan Hazel, Senior Lecturer, Animal Behaviour, Welfare & Ethics, from University of Adelaide said: "Recent research suggests listening to audiobooks can reduce high-stress indicators such as barking, howling, pacing or standing in kennelled dogs. "Humans have selected canine companions over thousands of years based on those that like being with people the most. Which now means they may not like it when we leave them alone. For some dogs, audiobooks may be helpful when an owner is not at home, providing a calming human voice." There's nothing a like a good book for a dog, apparently. 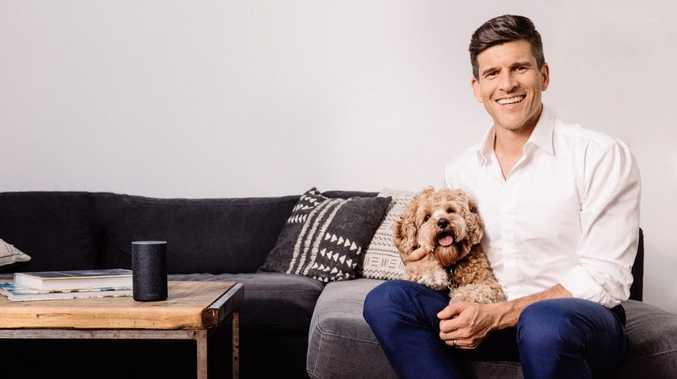 Osher Günsberg, host of reality TV franchise, The Bachelor Australia, said: "I'm passionate about mental health, and that extends to my dog, Frankie's, wellbeing too. I feel more at ease knowing Frankie is in the company of specially curated audiobooks chosen for their calm and even narration. Lately, I've been leaving him listening to The Lord of the Rings which, he seems to enjoy." Faith Harrsen, Marketing Manager, Sydney Dogs and Cats Home said: "Many of our rescue dogs find the shelter environment stressful, and we've found having a familiar voice and tone playing daily from the Audible for Dogs collection has contributed to a more calming space. "Aladdin, currently our longest-term doggy resident, has been listening to Sherlock Holmes narrated by Stephen Fry, along with our other kennelled dogs. "He can be reactive, barking as other dogs pass his kennel, but our team of behaviourists have observed that when the audiobook is playing it appears to distract him and he usually listens quietly and calmly, which has been wonderful to note."